In this tutorial I am going to show how I use a reference photo to create a realistic yet stylized illustration. There are a tons of different ways that people use reference images in their illustrations. Below I'll show you how I go about it. Let's get started! 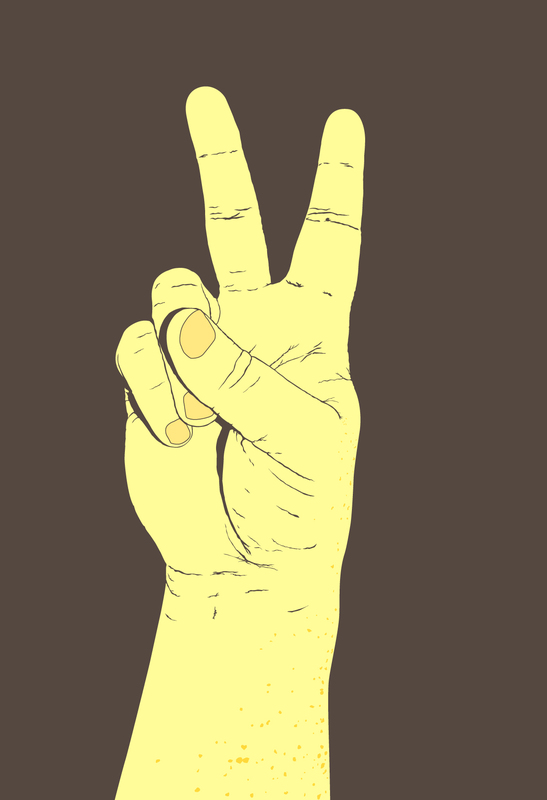 I needed a quick photo so I snapped one of my hand making a peace sign, it was the first thing that came to mind. I would urge you to quickly snap a photo of your own hand or something similar because my hands are not the prettiest things to looks at, haha! Open the photo file in illustrator, which is located in the Plus download "source" folder. Lock the reference photo and create a new layer on top for the linework. Using the Pen Tool simply start with the basic outline shape. I prefer to use a black .5pt stroke. Finish the basic outline shape, be sure to go around just the silhouette, and not diving to the shape. A common mistake I make is to start going around a knuckle and ending up going around a finger, don't do that. Choose the Align Stroke to the Outside in the stroke palette options. I do this so that you can change the stroke weight, or even change it to a fill, if you want, and it won't affect how the interior lines match-up. I have changed the line color to bright red and/or green so that it's easier to see, you don't have to do that though. Using the Direct Selection Tool (white arrow), select the point that juts between the fingers, copy (Command + C) and past the point in front (Command + F). The 2 additional points from each side of the selected anchor point will paste as well, delete those once the new points are established. This technique of selecting previously drawn points and creating a copy on top, helps to keep the linework spaced so that you don't have to deal with extra points and overlap. With the new point (green) selected, add two additional anchor points, where the shading/separation of the fingers starts, and delete the two points that were copied with the initial point. Next start to define the interior shapes by drawing with the Pen Tool. Draw one side of the shadow shape of the ring finger. The technique I employ is to use filled shapes as opposed to lines with strokes, which in my opinion is the best way to achieve the desired look, which has a level of realism, though stylized. Notice, even though the shadow shape of the ring finger runs into another shadow I will continue to complete the finger shape. I think it makes it easier to keep the finger shapes separate, because you can simplify/combine later if needed. To define the shapes of the fingers draw both sides of the shadow shape, as opposed to drawing a single line with a stoke to represent the finger. Be sure to close the shape. Continue on to the next finger shape. I like to go to the spots where I deviated from the shadow shape, just to make sure I don't miss anything. This would be the thumb shadow shape. Notice that I am including any major shadow shape, but skipping any of the minor shapes, because if they are needed we can add them later. I'll take care of the fingernails later, so I'll leave those for now. Complete the thumb shape, making sure the the start/end of the shape overlaps with the ring finger shape. Next will be the pinky (little finger) shape, since there are spots that the shadow shaped meets the edge outline. I will again direct select the point, copy and paste it in front, and from the copied point continue drawing the pinky finger shape. Finish the pinky shape. I never thought I would say that. There are a few shadow/shapes that will help to define the right side of the ring finger, so draw those. Again, a shadow shape touches the outline, so I do the same process of copying a previous point in front. The ring finger shape runs into the middle finger shape, so finish it up. While we're on the middle finger we might as well do the right side of it, and that should define it pretty well. Here is what the overall illustration should look like. I simply hid the reference photo and made the green outlined shapes black with a gray fill. Now it's time to put in the defining details that will take this to the next level. If you didn't do so in the last step, change all of the previous shapes to a filled black, except the outline. Next we'll do the 2nd layer of defining details. Draw any major (useful and/or noticeable) wrinkle or folds in the skin that helps to describe the gesture of the hand. Don't pay attention to the weird callus skin or any other defects, but focus on the overall defining parts. I like to start at the wrist and work my way up. Continuing up the hand, draw any additional linework that will help to describe the form of the hand. You don't need every single detail, but the more you put in, the more realistic the illustration will look. Select everything, except the outline shape, and change it to a filled black. Things are starting to come together. Now its time to get our nails done (haha)! Draw a simple shape around the fingernails. There are so many tones/shades in the nails. I think it looks best to have them be a simple flat shape. I don't know if I need to say it again, but I will just in case someone missed it. If there are areas where the fingernail shape will touch or overlap with a previously drawn shape simply just direct select (white arrow) the point(s) you need and duplicate them. Add/Delete anchor points on the duplicated line and continue drawing. Change the fingernails stroke to .5pt black. A good way to see if there are any problem areas is to change the outline shape to a white fill and drop a black background shape behind everything, then hide the reference photo. The thumb looks kind of awkward, too straight or tube-like, so it could use a little more detail attention. All it takes to fix any issues like this is to add a few more defining details to the thumb issue area. Change them to a filled black shape like the rest of the details. You could stop here, but for me the finishing touch is to add in freckles! Some people might like to draw the hair or shades of light. I have a bunch of freckles, so thats my thing. These final details will help to describe the volume of the drawing. A hint with drawing freckles is that they are all pretty much the same shape, so draw a few, then copy and move them around until they look right. I often like things better just as black and white, but if color is your thing it's very simply to color this illustration. You basically have four parts; the hand outline shape, hand detail, nails and freckles. Here I just dropped a nice brown background in and choose a dark brown shade for the hand details, changing the nail shapes to a filled yellow that is a little bit more saturated than the hand outline shape. Make the freckles a bright yellow and your done! Thats how I use a reference photo to create a realistic yet stylized illustration. The final image is below. You can view the large version here.